STANDISH, a village, a township, and a sub-district, in Wigan district, and a parish partly also in Chorley district, Lancashire. The village stands near the North-western railway, 3½ miles NNW of Wigan; and has a station on the railway, a post-office under Wigan, and fairs on 29 June and 22 Nov. The township bears the name of S.-with-Langtree, and comprises 3,257 acres. Real property, £15,788; of which £6,700 are in mines. Pop. in 1861, 2,655; in 1861, 3,054. Houses, 579. The manor has belonged, since soon after the Norman conquest, to the Standish family; and once had a castle. There are extensive coal mines, a large paper-mill, and barytes works. The sub-district contains also two other townships of S. parish, and two of Eccleston; and comprises 10,661 acres. Pop., 6,894. Houses, 1,259. The parish includes seven townships of Chorley district; and comprises 15,285 acres. Pop. in 1851, 8,594; in 1861, 10,410. Houses, 1,900. The living is a rectory in the diocese of Manchester. Value, £1,874. * Patron, H. Standish, Esq. The church was built in 1584, and restored in 1859; and has a fine E window, and a tower and spire. The p. curacies of Adlington, Coppull, and Charnock-Richard are separate benefices. There are an endowed grammar-school with £114 a year, an endowed school for girls with £53, and charities £402. Local studies information is held at Chorley, Ormskirk and Skelmersdale libraries. Details about the census records, and indexes for Standish with Langtree . You can also perform a more selective search for churches in the Standish area or see them printed on a map. The Register Office covering the Standish area is Wigan and Leigh. 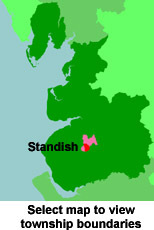 "STANDISH is a township, parish and village, in the hundred and deanery of Leyland, and in the archdeaconry of Chester, three miles N.N.W. of Wigan. The parish Church of St. Wilfred is rather a handsome structure, of the Tuscan order, erected about 1584, by the Rev. Richard Moodie, a converted Franciscan monk, and the first protestant rector of this church. The rectory is now in the patronage of Chas. Standish, Esq. The free grammar school here was founded at the beginning of the 17th century, it's endowment being about £90. per annum. Fairs are held on the 29th of June and the 22nd of November, for horses, horned cattle and toys. This parish contains ten townships, including a chapelry, and, in 1821, a population of 7,616 persons; of which number upwards of 2,000 were in Standish-with-Langtree. " Ask for a calculation of the distance from Standish to another place. "LANGTREE-WITH-STANDISH, a township in the parish of Standish, hundred of Leyland, county Lancaster, 4 miles N.W. of Wigan. It is situated near the line of railway to Preston, and now forms one township with Standish, which see." "STANDISH, a parish in the hundred of Leyland, county Lancaster, 3 miles N. of Wigan, its post town and 14 S. of Preston. The station on the London and forth-Western railway is three-quarters of a mile from the village. The village is situated on the old road to Preston. The parish, which contained a population in 1861 of 10,410, includes the townships of Adlington, Coppull, Anderton, Charnock Heath, Charnock Richard, Duxbury, Shevington, Standish-with-Langtree, Welsh Whittle, and Worthington. There are extensive collieries, a paper mill, and a cotton mill, which together afford employment to a large number of hands. Standish has belonged to the Standish family from near the period of the Conquest. In the vicinity Roman coins have been found. The living is a rectory in the diocese of Manchester, value £1,874. The church, dedicated to St. Wilfred, has a spire of the 15th century containing six bells, it was rebuilt in 1584 by the Rev. R. Moody. The register dates from 1558. In addition to the parish church are the following district churches, viz:, at Addington, Coppull and Charnock Richard, the livings of which are perpetual curacies varying in value from £150 to £120. There is an endowed grammar school, with an income of about £100, also girls' school, with about £50, founded by Mrs. Mary Smalley. There are National and Sunday schools. The Wesleyans and Roman Catholics have each a place of worship. Standish Hall is the principal residence. C. Standish, Esq., is lord of the manor and principal landowner. Fairs are held on the 29th June and 22nd November." In 1835 the parish of Standish contained the townships of Standish and Langtree, Charnock Richard, Welch Whittle, Duxbury, Coppull, Heath Charnock, Shevington, Anderton, Adlington and Worthington. You can see the administrative areas in which Standish has been placed at times in the past. Select one to see a link to a map of that particular area. View maps of Standish and places within its boundaries. Poor Law records held at Wigan Archives. For probate purposes prior to 1858, Standish was in the Archdeaconry of Chester, in the Diocese of Chester. The original Lancashire wills for the Archdeaconry of Chester are held at the Lancashire Record Office.